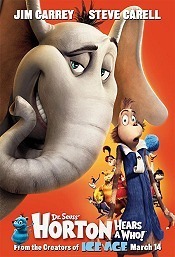 Other Studios : B : Blue Sky Studios : Dr. Seuss' Horton Hears a Who! 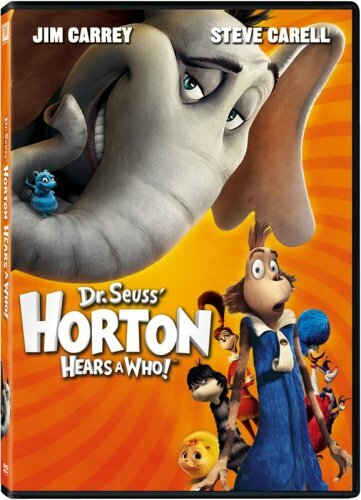 Alternate Title: Horton Hears a Who! BCDB Rating: 4.6/5 Stars from 15 users. This page has been viewed 36 times this month, and 8145 times total. Cartoon Characters: Horton, The Mayor of Whoville, Kangaroo, Vlad, Morton, Councilman, Yummo Wickersham, Dr. Mary Lou Larue, Tommy, Sally O'Malley, Mrs. Quilligan, Rudy, Miss Yelp, JoJo, Hedy, Hooly, Old Time Who, Helen, Heather, Town Cryer, Who, Another Who, Who Mom, Hildy, Holly, Who Kid, Willie Bear, Joe, Who Girl, Helga, Obnoxious Who, Katie, Heidi, Haley, Hanna, Glummox Mom, Angela, Jessica, The Dentist, Wickersham Guards, Narrator. Directed By Jimmy Hayward, Steve Martino. Produced By Bob Gordon, Audrey Geisel, Chris Wedge, Chris Meledandri. Written By Cinco Paul, Ken Daurio, Dr. Seuss. Editor: Tim Nordquist, Jim Passon. Originally Released on March 14, 2008. "Horton Hears a Who!" and "Dr. Seuss' Horton Hears a Who." CGI animation. This film marks Jim Carrey's debut as a CGI-animated character. Production budget estimated at $85 million. You can watch this cartoon today on your computer. Just click below to start viewing "Dr. Seuss' Horton Hears a Who!" online now. Do you have anything to add to this page? Have we made any mistakes... or do you have any additional information about Dr. Seuss' Horton Hears a Who!? If so, we would love to hear from you. Please send us a quick note with your additions or corrections to this page, and we will make the corrections as soon as possible! Do you love Dr. Seuss' Horton Hears a Who!, or do you think it is the worst cartoon ever? Let us know what you think! Surely you have an opinion... so share what you think. Take a minute and post your own comments about this cartoon here. Dr. Seuss' Horton Hears a Who! by Big Cartoon DataBase is licensed under a Creative Commons Attribution-NonCommercial-ShareAlike 4.0 International License.